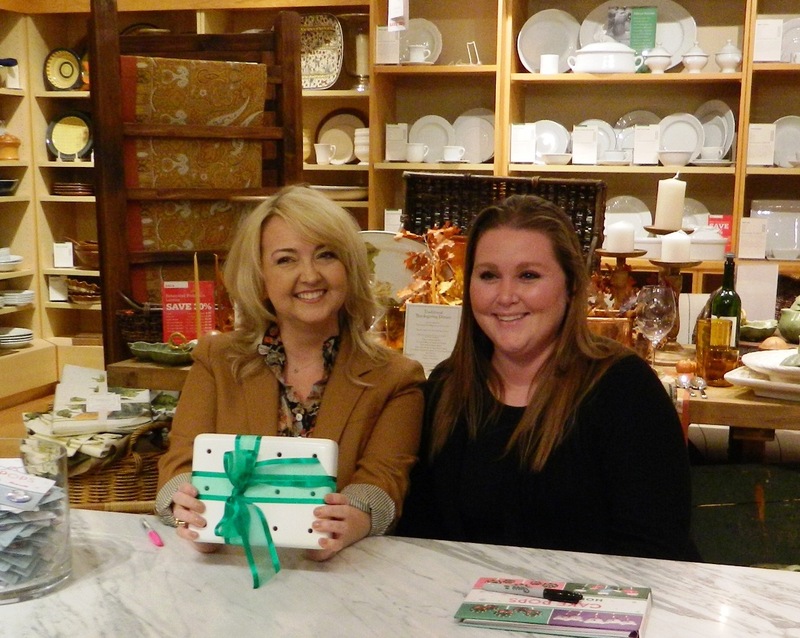 Well, yesterday was pretty much the highest point in my baking journey… I got to meet Bakerella!!! She was so sweet and personable, it felt like I was chatting with an old friend. I had never been to a book signing before and I really didn’t know what to expect, so we got to the mall two hours early (which turned out to be about an hour and fifteen minutes too early, lol). The whole KC Bakes crew came… Dad, Mom, hubby & myself. Mom was in charge of my camera, and hubby was in charge of my iPhone. I told them to just take pictures of everything… when in doubt, take a picture, I can always edit them later, haha. I apologize if this is too many pics, but they captured so many cute moments that made my heart swell with pure glee. Bakerella is here! See that photographer in blue? That’s Bakerella’s mom, Sandy! 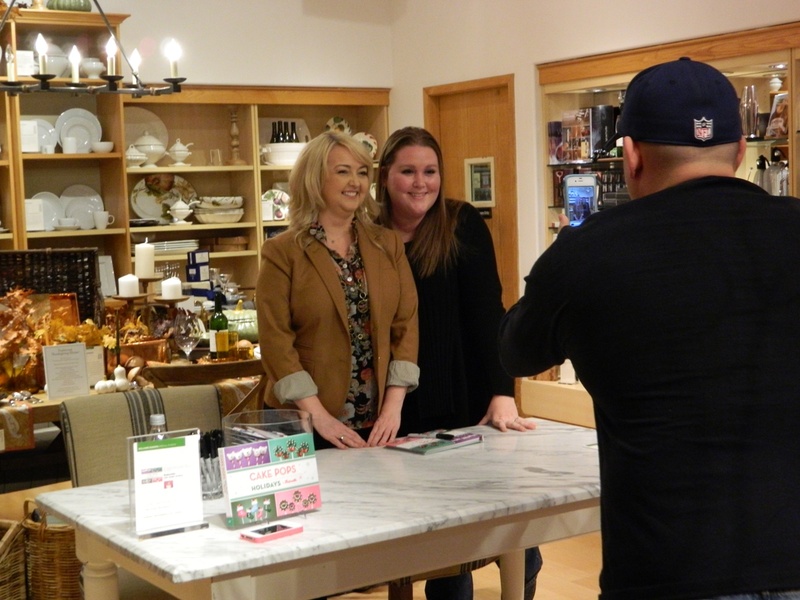 She took pics of everyone who sat down with Bakerella, and she is just as sweet as her daughter. We brought Bakerella a Mini Stand that holds paper straws. 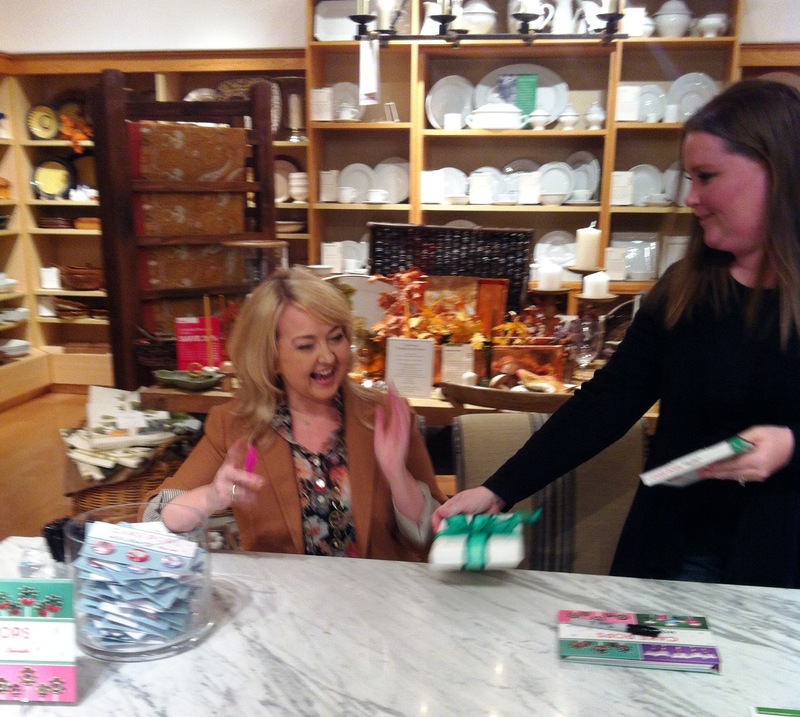 When it was my turn in line, I said, “Hi my name is Kim, and I brought you a little surprise…” but when she saw the stand, she knew who I was! She jumped up and gave me a big hug; it was quite possibly the best moment of the day for me & brought a few lil’ tears to my eyes… it was so, so humbling for her to know our stands. 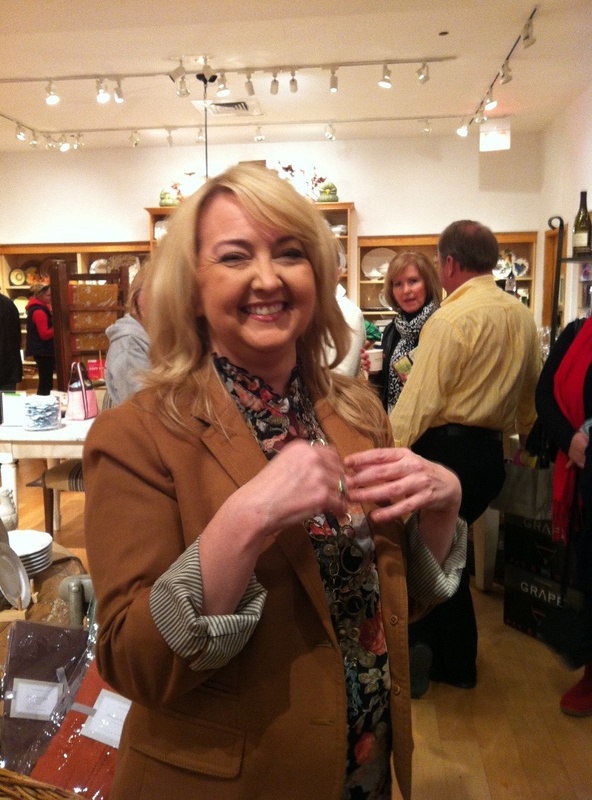 In some pics I look beet-red; that Williams Sonoma was so warm! Also, I was a mix of nervous and excited. Anyhoo, here we are! Never having been to a book signing, I thought the process would be that you get one pic & you’re done. But I told her my dad was here, and she invited him over and told him how much she liked his work… I almost cried, I’m so proud of my dad! See that open book in front of me? 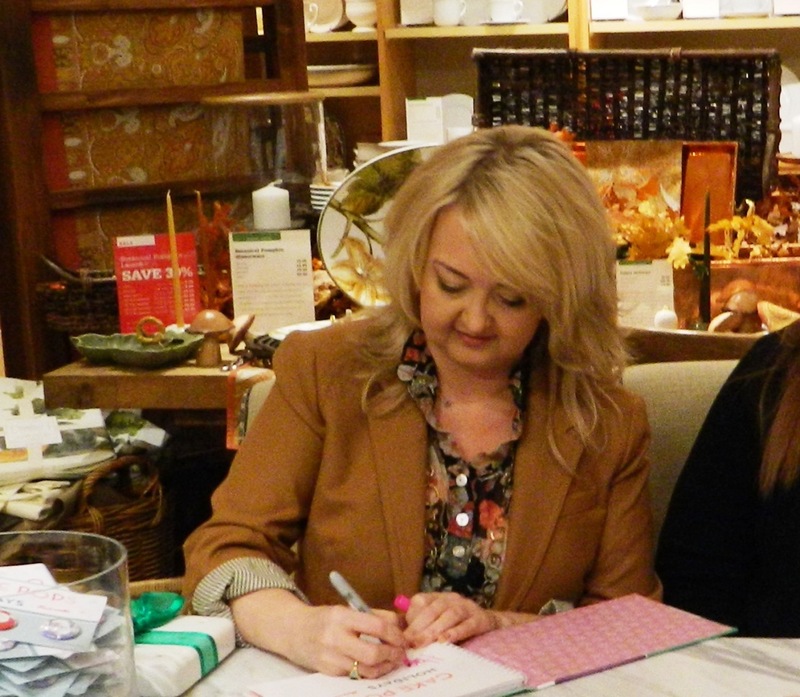 She had everyone who came sign the book… what a cool memento for her! 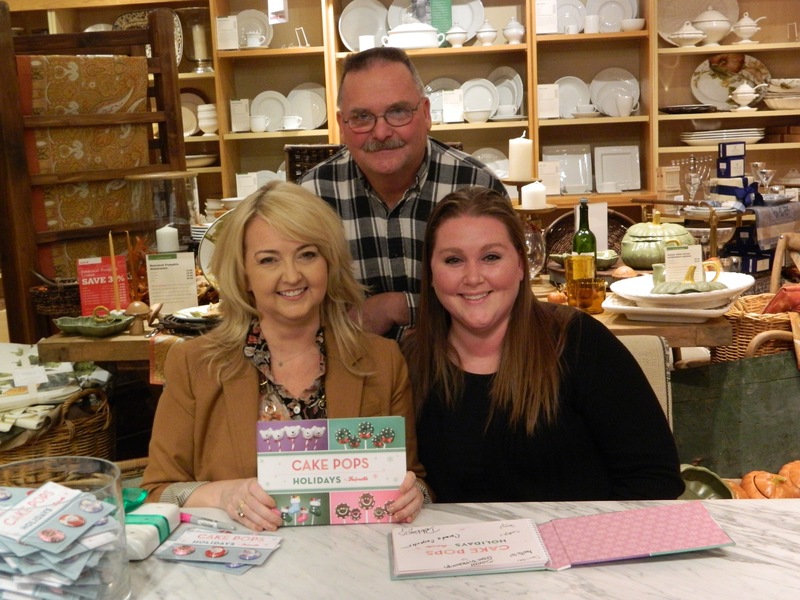 Bakerella’s mom then insisted my mom & hubby get in the pic too, and she snapped one of all of us with her camera. Then, this was so cool… Bakerella got her own iPhone out and had my hubby snap a pic of us! I didn’t discover it til later in the afternoon, but she Instagrammed/Tweeted the pic… click here to see. I almost fell out of my chair! I can’t express how grateful I am for her kindness. I’m also so thankful for all of YOUR support!!! On Facebook, Twitter, Instagram and here on the blog, your comments are always so positive and encouraging, and that means so much. Soooo, before I left, I asked Bakrella if she could sign a book that I could giveaway on my blog, since not everyone can get to her signings. She said, “Of course!” with a big smile. 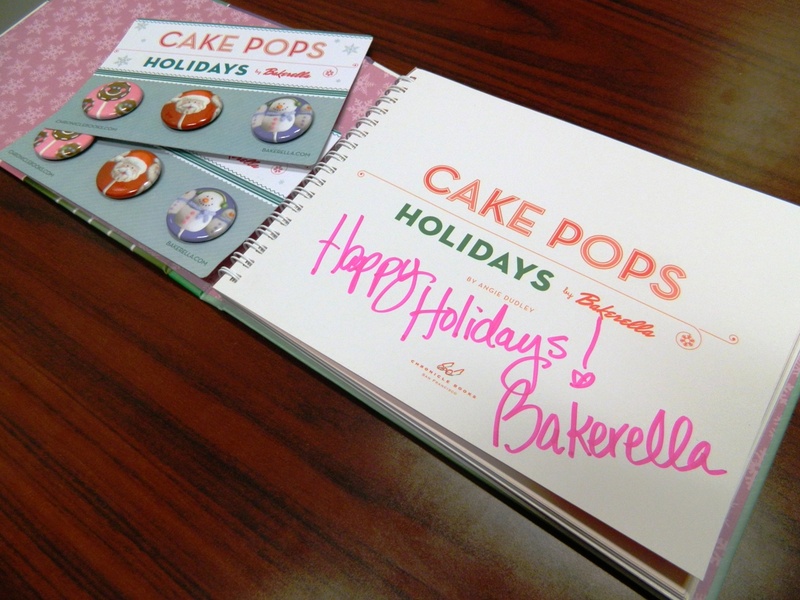 One (1) copy of Cake Pops Holidays signed by Bakerella + two (2) sets of Bakerella Cake Pop pins! My favorite holiday tradition is cooking Romanian food with my mom. I am now passing on that tradition to my almost 5 year old daughter. One of the holiday traditions that I have is to make baked goods and give them out as gifts. I love the idea of giving something from my heart that is personal to me. My husband even gets involved. He makes the best cookies!! Each year I try to incorporate new things. My favorite tradition is baking cookies with my little girl. It’s a new tradition seeing as she is 3. We had tons of fun last year and will continue it every year now! My favorite tradition is going to church on Christmas Eve! my fav holiday tradition…. lunch with my family on christmas day…everyone would cook a dish!! My favorite Holiday tradition is putting up the Christmas tree with my family. We get so excited, makes it hard to wait until the day after Thanksgiving!! My favorite holiday tradition is spending a weekend baking with my mom, sister, niece & other family to give away home made treats to family & friends. The Christmas music, warm ovens, yummy smells, laughter & time spent with my family is priceless! Making cake pops is quickly becoming my little family’s favorite tradition! I’ve been following Bakerella on Instagram for a while now and started following you a couple weeks ago and have truly enjoyed your postings! My favorite tradition growing up was that always on my birthday (Dec. 10th) my dad would go and get the tree we had tagged at a local tree farm, we would order pizza and decorate the tree and celebrate. As I get older and my own kids and brothers kids have been added and the tradition just grows. Wow Iam so excited for you!!! I share your enthusiasm, sorry if my english is not to good I speak spanish and I absolutelly lobee to cook, specialy pastries and my favorites are cupcakes and cakepops, I love bakerella and also your passion that you show in your blog. So answering to your question like I live in Chile traditions here are a bit different because our christmas is in Summer so what we do here is a nice dinner outside and the special thing is that we all cook it together and we always cook way too much so we all go as a family to visit some charity shelters to give food and lots of gifts and in our community is now a big thing every year we get lots of donations. The day after Thanksgiving our city holds a holiday river parade. All along the river there are Christmas lights in the trees which are turned on right before the parade is about to begin. Since my children were babies it has been a family tradition to attend this holiday parade. No matter what the weather, we are there. This is one of my most favorite holiday traditions. 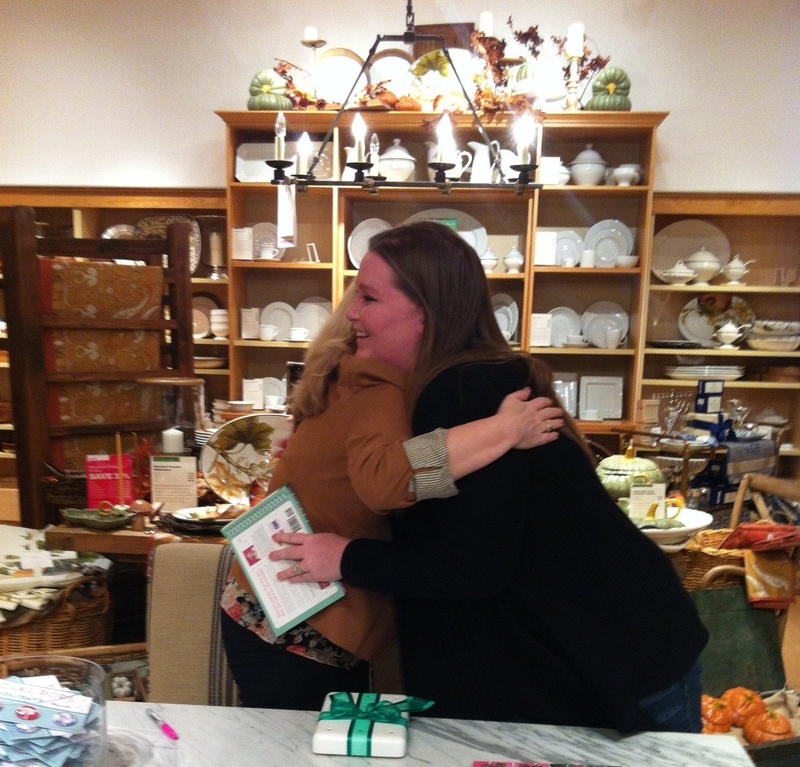 By the way your experience meeting Bakerella brought tears to my eyes. I became so emotional and can only imagine what you must have felt. Thank you for also being an inspiration and always willing to lend a hand with your tips/experiences. My favorite tradition is putting up the tree on my birthday. When my husband and I were first dating (almost 20 years ago), he bought me a Christmas tree for my birthday. So, now, we decorate every year on my birthday! All of our family, relatives, and friends are invited to whoever is hosting Christmas Dinner. So, we usually have a 30 or more people. After church on Christmas Eve, we have a small party with just the immediate family. We sing carols and eat Christmas goodies and most importantly we just enjoy being together. As much as I love the big Christmas Dinner, my favorite Christmas Tradition our small Christmas Eve get together. Having a Norwegian background…my favorite holiday tradition is making Lefse with my mom and Nana. It’s an all day event but tons of fun! I look forward to it each year!! My favorite memory was when I was lil girl and my parents surprised me with a baby grand piano with red roses on it! I always told them i would practice ALL DAY LONG if I had a real piano (vs a small keyboard )…of course I didnt really practice much more! My parents were blue collar workers & my dad won the money at work fora suggestion award! He created a device that saved the company alot of $$$. Thry bought me my childhood dream with it! My favourite festive memories all revolve around food. But the one I recall best was quite funny. We have a custom in our family of inviting for all festive lunches/.dinners friends staying in our city who are alone – either single or without their families for any reason. 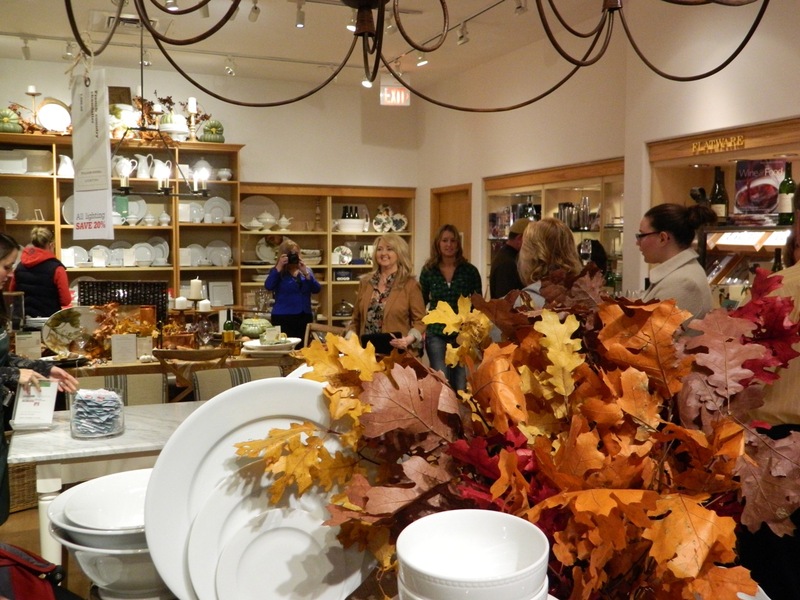 Once we invited a whole lot of friends and come lunch time – we waited really long for one of the friends to show up. By 3pm we were really hungry – and those being the days before cell phones – and decided not to wait for him anymore and just have lunch. Oh my god Kim! I must say how happy I am for you. I was crying with joy just reading how happy this made you! Congrats dear! Well anyway my favorite holiday memory is when my dad was still alive! See I am an only child and when I started having children my dad wasn’t too thrilled with me. But as they were born he fell in love with each of my girls. Well in the year he passed it was a few days before thanksgiving and he always called me his turkey. So this year my daughters were 8 and 6 and he was saying how he couldn’t wait for thanksgiving because now they were old enough to help him cook the Thanksgiving turkey. (Which really meant play pranks on me all week long). It may be corny to some but in my family we don’t quite always follow tradition but my father was our rock so to have him bid with my children and actually PLAN out daily pranks on me was a try blessing and memory I will always cherish! My sister and I grew up loving “Jingles” (Keebler) holiday cookies. Way back when, they used to be Anise flavored! They stopped making them years ago (now they are just butter flavored), so a few years ago I found a recipe for some anise flavored holiday cookies. I’ve been making them and sending them to my sister and my mom for Christmas each year since then! However, this year it will be a surprise…since I’ve started my cake pop business back in February, I am going to attempt Vanilla Anise CAKE POPS!! So excited to start this new tradition and each year I’ll create a new design! My favorite holiday tradition is… The last-minute tree shopping/washing/decorating! Hahaha! It’s a bit weird, but it just isn’t Christmas without all the elements-smell being one of them. We have a fresh tree every year, decorated in just white lights and candy, that we all sit around open presents. This year will be an extra challenge, with my one-year-old on the run, but it will be worth it to see the lights sparkling in her eyes! My favorite holiday tradition is spending a few days baking and taking treats around to friends and neighbors. My kids are now getting old enough to help and can’t wait to spend some time in the kitchen with them! How exciting you met Bakerella!! My favorite holiday memory is my mom scrambling to get the tree up and she had this little bird ornament that chirped the whole time we opened gifts and dinner on Christmas Eve. Oh how I miss my family Christmases. Our favorite holiday tradition is we start to set up our Christmas tree and decorations around the house the day after Thanksgiving. Lots of fun with the hubby, kids and I! My favorite tradition is opening one gift Christmas eve, before going to service. It kicks the anticipation into high gear, and lets us focus on giving, rather than recieving to see the reactions in a much calmer setting. My family Christmas tradition was making tamales with my grandmother, mom, aunts, and all female cousins. My grandmother was always the one in charge of finding the perfect meat! I sure do miss her!! So happy you got to me Bakerella, Lucky!! My siblings and I get together with first cousins each Christmas. We hold a White Elephant gift exchange between us. The funny part of the tradition is that one year I gifted this silly music CD and every year since then, its been part of the gift exchange. Cracks us all up waiting in anticpiation of who is getting the cd next! I love decorating the tree and house with my husband and kids while the Christmas music is playing. Gets me in the Christmas mood. My favorite holiday tradition is our tree trimming parties that start the day after Thanksgiving. My family takes turns trimming everyone’s tree while watching Christmas movies like Christmas Story, Rudolph the Red Nosed Reindeer and a Charlie Brown Christmas. Favorite Holiday Memory and Tradition-baking with my Mom and Grandmom. I make spritz cookies every year to remember them and honor the tradition. I put on Christmas music, get the kids to help decorate and remember and tell stories of Christmas past. Puts a smile on my face! My favorite holiday memory was when a cousin of mine who passed away gave me a serving plate for Christmas when I was little, I was so upset thinking why would he have done that? Well inside was a $100, he had made a joke on me! I will never forget that! I have so many! Listening to Christmas music while we put up the tree, hot cocoa when you come in from the cold, all the delicious food, and putting up the rest of the decorations. Those are just a few off the top! Now that I have children, there ar so many new memories to cherish and traditions to start. I love, love, love this time of the year!!! One of my favorite holiday traditions is Black Friday shopping. This is a something my mom and I have done for the last four years together. There is nothing like bonding and having mommy/daughter time sitting in lines in front of a store for hours, talking, laughing and people watching till the wee hours of the morning. The other is spending Christmas morning with my parents, husband and kids, sitting around the tree watching the kids open their presents and my dad fussing half way thru remembering he forgot to hit record on the camcorder!! Christmas if my favorit Holiday. My favorite holiday tradition is all the baking with my mom! My favorite holiday tradition is my uncle’s Christmas eve dinner party. I love catching up with family and eating a late, late dinner! Lighting the menorah and frying up latkes! my favorite is just getting together with those that I love and cooking a large meal, giving our thanks to the lord above and sharing lifes memories up to date. My favorite holiday memory was openings my stocking with my grandma….I loved how special she always made it for my siblings and I. So very cool you got to meet her! I would love to!! My favorite Holiday tradition is baking goodies to give to close friends! I love it! My Christmas Eve tradition is my favourite thing about Christmas.. my mum and I go collect our turkeys and have tea and cake. Then I go home and make a complete (icing cloud) mess of the kitchen decorating my Christmas cakes, singing along to Christmas music, with a nice glass of red wine 🙂 I love Christmas! Every year me, my husband, and our daughter pack our bags for a very short 25 minute drive to my grandmothers for a 3 day christmas stay lol I know it seems ridiculous, but I can’t stand the thought of not being with my grandma on Christmas morning! My favorite holiday tradition is buying or making an ornament for my daughter, sister and nephew. Some years I find the perfect ones in the store, others I make a special one just for them. It’s a small few of us in my family that celebrate it so it’s so very important to me. My favorite holiday tradition is baking! I love to make tons and tons of different cookies, muffins, breads. And then of course decorating the cut outs with my kids! eating cornish hens instead of turkey at thanksgiving! My holiday tradition is to bake a bunch of different cookies and goodies for the holidays and wrap them up pretty and give them out to friends and family. My favorite holiday tradition putting up my tree and buying new ornaments every year. No matter how small of apartment I have lived in over the years, I made sure there was always room for a tree. I now have a son that will be old enough this year to open presents and I cannot wait to have him come down the stairs to see all of his presents in front of the tree with all of the ornaments I have collected over the years. First off, I have to say, I got chills reading your story of meeting Bakarella. She is so inspiring isn’t she!? Now, my favorite holiday tradition is watching my boys eyes light up the second they see the gifts under the tree, and watching them open each gift. It makes the stress that sadly does seem to come around every holiday season, so worth it!!! I have two favorite holiday traditions. The first is baking and decorating sugar cookies with my kids and cousins and the delivering them to family members and friends. I did this with my cousins growing up! The second tradition I love is having my kids make ornaments for everyone in our extended family (aunts, uncles grandparents….). We host thanksgiving st our house and my kids put an ornament at each place setting as a kick off to the Christmas season. My favorite Holiday tradition is scaring the pants off my daughter with Santa. She HATES Santa and each year her reaction gets funnier! A close second is decorating for Christmas. My favorite holiday tradition would be making thanksgiving dinner. Since I was 15 my mom had make the turkey, since then I am the one in charge of dinner. Its something that I will pass down to my daughters someday. I am so in love with making cake pops! I cannot wait to start making some holiday ones. My favorite holiday memory is making Christmas cookies with my Mom and butter tarts with my Grandma! My favorite holiday tradition is getting together with my family on Christmas Eve and making/eating my grandmother’s special chicken noodle soup together (she passed away over 15 years ago but we still do it every year). Also love picking a new ornament for me and my husband’s tree that reps something that happened that year. When my grandmother was alive many years ago, I was really young (3?). We have a huge family so we would all go to my grandmothers house and all my cousins and I would play around a big Christmas tree and we’d get to see all of our uncles and aunts from around the world. After my grandmother died we haven’t had a large tree ever since so 20 years without one makes you miss when you did. When I was little we were able to stay up all night Christmas Eve and open a present at 12AM Christmas morning. I always chose the smallest gift, while my siblings always chose the biggest. I never understood why, wouldn’t you want the excitement of the biggest present on Christmas?! Anywho, I passed the tradition along to my 3 girls. Only, I buy them Christmas pajama sets and package them up all sweet, pink, girly, cute…anything that would attract there attention (it’s usually their only gift under the tree, as they all still believe in Santa). And they get all excited to wear them. We then bake cookies and make a special treat for the reindeer, drink hot cocoa and go to bed. I love Christmas! Our fave holiday tradition is we don’t like “traditional” dinners, so we each pick 2 of our favorite (sometimes fave at the moment) foods and that’s what we eat for that meal. It may go well together, it may not. But it doesn’t matter because we all LIKE what is served! My family consists of mix of Venezuelan, Philippino, European and American “characters” who love to eat and party! Our holidays are an eclectic mix of cultures, delicious food (mmm Venezuelan hallaca – yum!) and traditions. My favorite tradition (that I remember since I was a little girl, and now share with my two awesome kids) is the celebration of “Fin de Año”. It is a way of saying farewell to the “old year” – that will soon be gone, and welcoming the “new year” with open arms – hoping that it will bring good luck, health, love and prosperity. As the countdown to midnight begins, we must eat twelve grapes super fast (making a wish as we eat each grape – which represent a month in the year to come), drink champagne, cheer “goodbye old year”, give everyone hugs and kisses, and wish them a Happy New Year! While some dance “gaitas” (traditional Venezuelan festive music), others light fireworks and firecrackers. Another popular tradition is to wear new clothes for the first time to bring good luck, and also drag empty luggages around the neighborhood – as a way to mark the start of a new year filled with traveling and prosperity. … “Fin de Año” has a special place in my heart… I even met my dad for the first time (after thirty years) during a New Year’s Eve celebration 😉 With all these traditions, I hope my children make fantastic memories – as I did! Baking for the Christmas holidays! In my mind there is nothing more fantastic than giving a gift made from love and the heart, with that personal touch! My favorite tradition is getting all the generations together to make candy. Finally getting my family (who live all around the world) back together for Christmas dinner!! My favorite holiday tradition is our Christmas Eve appetizer dinner & opening one present. For some reason the Christmas Eve present always feels so much more exciting than opening all the presents on Christmas day. My cousins and siblings do a White Elephant gift exchange instead of individual gifts for each other. The best part about our tradition is during the first year, I included in the gift this silly Xmas CD of a foreign comedian singing Xmas songs. My cousin who got the gift included it into her contribution gift the following year – still unopened! Now its an ongoing tradition for the person who got it to include it in the following year. It’s hilarious seeing the anticipation of who’s getting the CD next!!!! Putting up our tree, then turning out the lights and gazing at the tree, singing a Christmas Carol, and sharing something on the tree that reminds you of the true meaning of Christmas! Always a special kick off to Christmas!